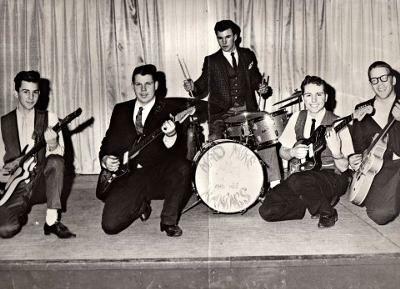 IN THE EARLY 60's, I PLAYED IN A BAND WITH SKIP AND WARREN NICHOLS, BOTH OF THEM WERE FROM BRENTWOOD, NY. I WAS FROM BAY SHORE, A NEIGHBORING TOWN. THE BAND WAS "MAD MIKE & THE MANIACS". WE PLAYED A LOT OF LOCAL DANCES AND SOME CLUBS IN THE AREA. IN THE LATE 60's, I WAS IN A BAND WITH WARREN CALLED "THE SUPER SUDS OF RHYTHM", AND SKIP BROUGHT SOME RECORDING GEAR TO A LONG ISLAND CLUB CALLED THE 1890's IN BALDWIN, NY. I REMEMBER THAT HE RECORDED THE ENTIRE NIGHT 4 45 MINUTE SETS. I NEVER GOT TO HEAR THE TAPES, BUT I REMEMBER THAT HE WAS VERY PROFESSIONAL WITH THE LEVELS & THE MIXING. I FOLLOWED HIS CAREER AS A STUDIO ENGINEER, BUT WE LOST TOUCH IN THE EARLY 70's. I REMEMBER THAT SKIP ALWAYS HAD "GREAT EARS" FOR THE SOUND OF INSTRUMENTS & THE VOCAL BLEND.